You can send recommendations to users about the content (movies, shows, music, games) you want them to watch. Recommendations appear on a "Recommended By Your Apps" row on the Amazon Fire TV home screen. Recommendations encourage users to engage with your app. 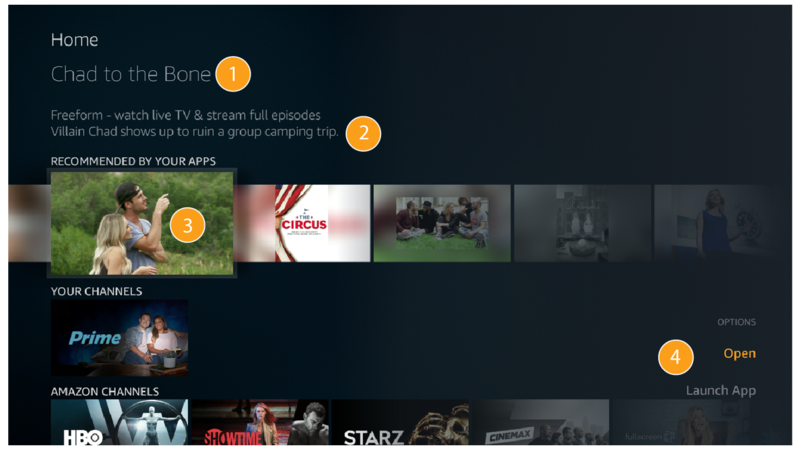 By appearing on the Fire TV home screen, recommendations are visible within the user's regular view. The recommendation cards entice users back into your app with minimal effort. For more information about recommendations, see Recommending TV Content in the Android documentation. The Android TV Leanback Support Library app also contains sample code for sending recommendations. Note that recommendations are not supported on Fire TV Stick Basic Edition. On the Amazon Fire TV home screen, the "Recommended By Your Apps" row shows all recommendations from apps the user has currently installed (and opened at least once). All recommendations from third-party apps appear as visually attractive cards in this row. You control the look and appearance of the recommendation cards. Recommendations are sorted by a selection algorithm provided by Fire TV. The row refreshes regularly. If you select a recommendation and then click the Menu button on your remote, a launch menu appears in the lower-right corner. The menu shows different viewing options. If a user selects "Open TED TV" instead of "Watch," the TED TV app will launch (instead of the selected content). 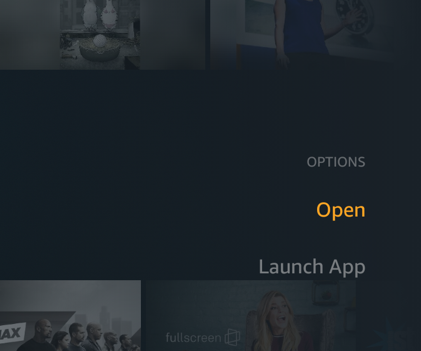 Selecting this option is the same as launching an app the normal way on Amazon Fire TV. Additionally, you can control your app's name in this launch menu by setting the value for DISPLAY_NAME, which is an Amazon extra in your recommendation. The following image shows the various attributes of the recommendations row. There must be at least 5 recommendations in total sent from all apps. The user can't have any viewing restrictions set under Settings > Preferences > Parental Controls. Note that Android limits the number of notifications to 50. This limit includes both standard notifications and recommendations combined. You will need to create the logic that determines which recommendations are shown to which users. Make sure the content you recommend is appropriate for the audience. See Best Practices for Recommendations for more details. In general, you build a service that looks at your app's content and suggests recommendations. You send the recommendations as notification objects, tagged with a recommendation category and configured with the values you want. You also register the service with your app's manifest. When you define the recommendations, you set the foreground and background image, color, app icon, title, subtitle, and more. See Recommendation Row in Google's Android TV for more design and UX details with recommendations. You can group your recommendations using the NotificationCompat.Builder.setGroup() method. For more details on creating recommendations, see Send Recommendations that Include Amazon Extras. 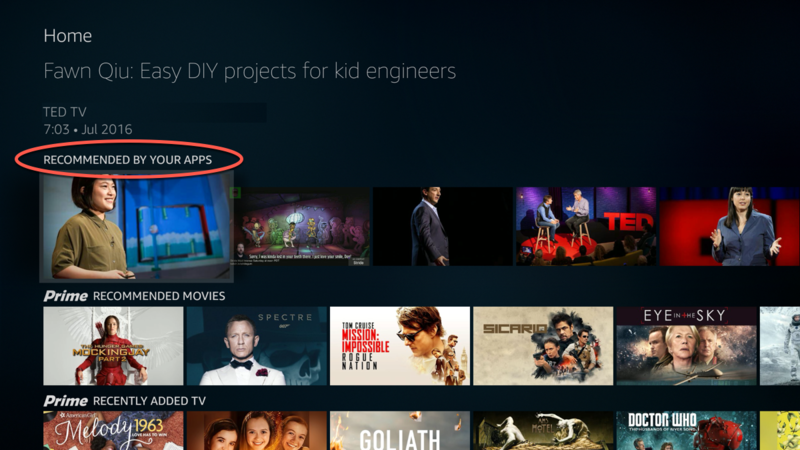 Amazon extends the Android recommendations API to provide deeper integration with Amazon Fire TV. Note that using Amazon's extras is optional. If you don't use the extras, your recommendations will still work on Fire TV. However, you will lose out on some FireTV-specific features. The Amazon extensions won't affect the display of your recommendations on other Android TV platforms. Can I view metrics to see clicks on recommendations from the Fire TV home screen? You can add an extra to the pending intent. This will allow you to capture the origin of where the link was clicked. Can users turn recommendations off? No. Although users can turn notifications off for specific apps, they cannot turn recommendations off. For more background reading on recommendations, see Android TV Recommendations: What's in it for my app or game?.